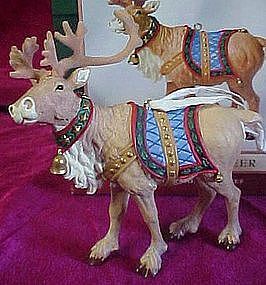 Hallmark keepsake ornament is a reindeer to pull the sleigh for Santa Claus. This reindeer can stand by itself or be hung on your Christmas Tree & stands about 4 1/4" high. Ornament is brand new, never used, displayed or hung from tree. Mint in box with price tag still attached. Sculpted by artist Duane Unruh, made to compliment the keepsake ornament, Santas sleigh. 2001.